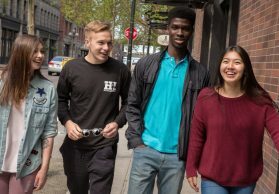 At Seattle Pacific University, the city of Seattle and all its sights are just outside your door. 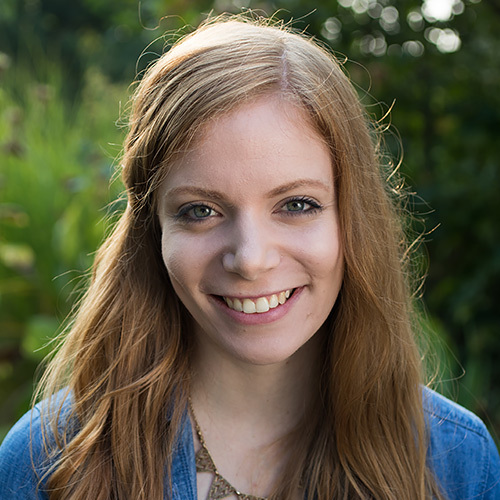 But adventures to other worlds are just a bus — or as the case may be, boat ride — away. Ferries from downtown Seattle can transport you across Puget Sound to several interesting, exciting, and beautiful places. One great day trip you can take is to Bainbridge Island, home to stunning waterside scenery, whimsical street fairs, and great food. Hop on the ferry, and 35 minutes later, you’re on the island. 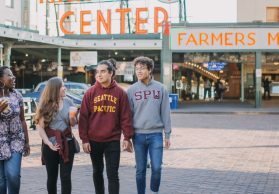 Seattle Pacific students Ray Lee ’19, Brianna Dolce ’21, and Sara Lippert ’20 recently made the voyage one afternoon. All aboard! The ferry to Bainbridge Island leaves from Pier 52 in downtown Seattle every 40 to 60 minutes. Find the full ferry schedule here. Cars, bikes, and people board the ferry to Bainbridge Island at Pier 52, on the waterfront below Pike Place. Arrive early, and you’ll find food, street performers, boardwalk rides, and quirky shops. 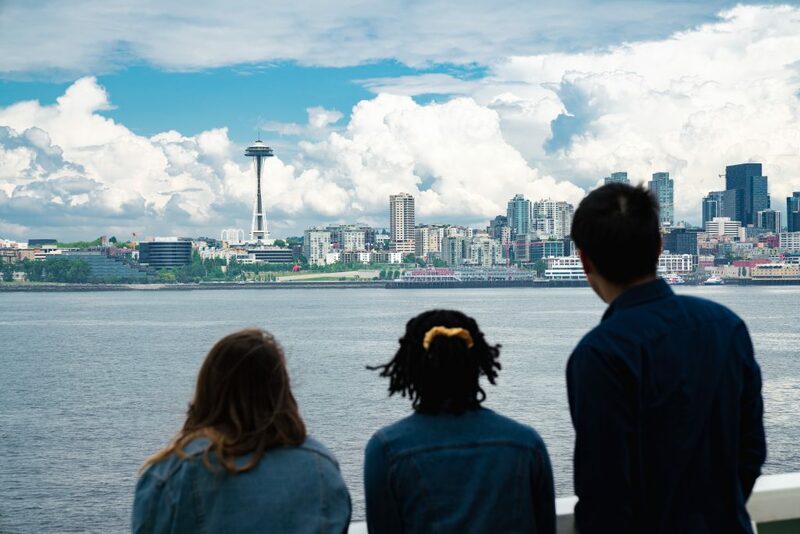 If it’s a nice day, head over to the front of the ferry where you’ll find fresh sea air and dramatic view of the Puget Sound as you soar across the waves. On colder days, you can cozy up inside the ferry with a hot drink from the onboard snack bar and watch the outside world from the big windows. A short walk from the ferry dock along Winslow Street will bring you to the main street of Bainbridge, with restaurants, shops, coffee houses, art galleries, and more. 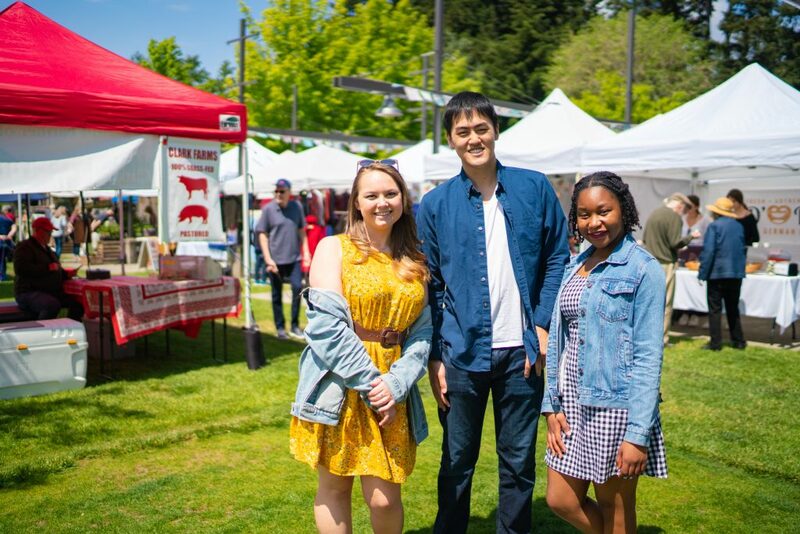 These SPU students stopped by on a Saturday afternoon, when the Bainbridge Island Farmer’s Market was in full swing. The market is open mid-April through early December, every Saturday from 9 a.m. to 1 p.m.
Bainbridge is also home to many beautiful natural sights. Grand Forest: Venture farther into the island — 12 minutes by car — to visit Grand Forest. With pathways that wind through towering trees and lush foliage, you can hike, walk, or bike along well-marked trails to your hearts content. 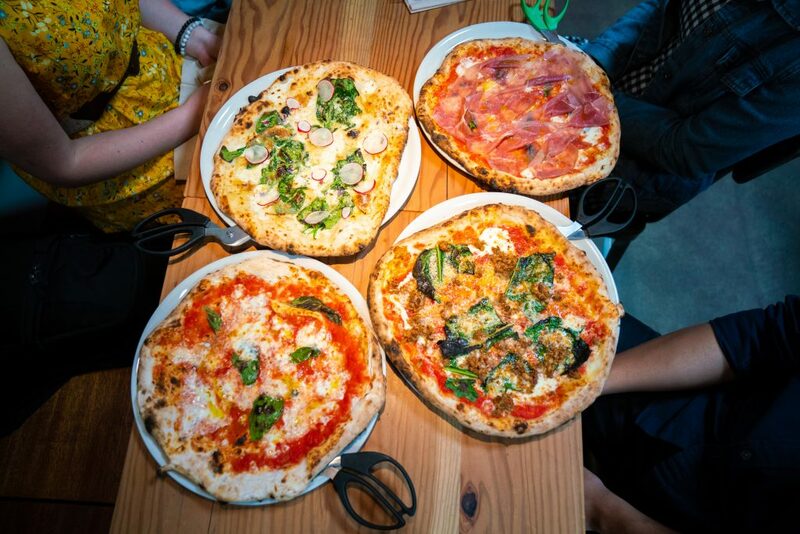 Bruciato: One of the highest rated Bainbridge eateries on Yelp, this Neapolitan-style pizzeria with wood-fire ovens and mouthwatering pizza combinations that you slice through with a pair of conveniently designed pizza scissors. On nice days, they open up the front wall so you can enjoy the breeze and life passing by outside. Prices for antipasto range from $6 to $20 and prices of pizzas range from $11 to $20, coming in 12 or 14 inch sizes. Bruciato is open from 11:30 a.m. to 10 p.m. Monday through Thursday and 11:30 a.m. to 9:30 p.m. on Friday and Saturday. Hitchcock Deli: Just down the street, Hitchcock is known for its sandwich options, which range from classic pastrami to Cuban style pork to egg salad, along with much more. The deli also serves salads — beet, kale, or potato — and the soup of the day. Sandwich prices average around $12 each, salads are $6 for a small and $10 for a large, and the soup is $4 for a cup and $7 for a bowl. 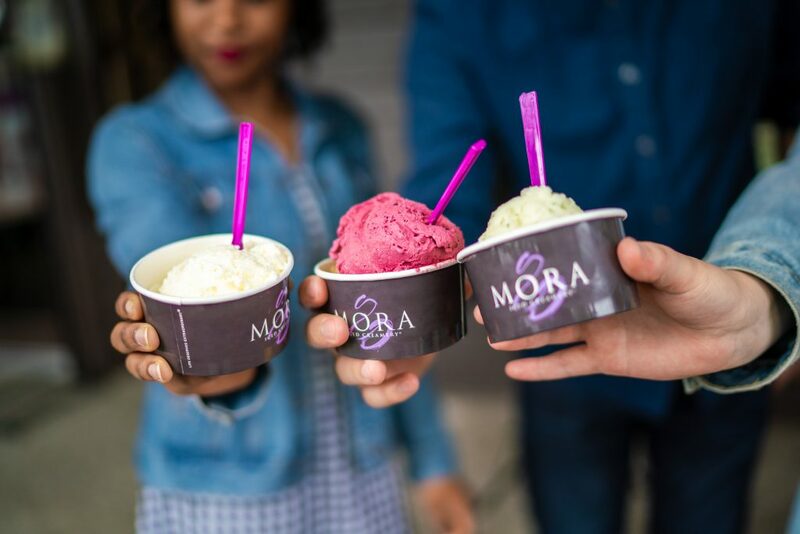 Mora Ice Creamery: Try from 37 different flavors, ranging from old world tastes like gianduja, similar to chocolate, and Dulce de Leche, similar to caramel, to new creations like goat cheese with fig or lemon bar. The shop is open from 11:30 a.m. to 8:30 p.m. Sunday through Thursday and 11:30 a.m. to 9 p.m. on Friday and Saturday. J’Aime Les Crepes: With a Parisian atmosphere, J’Aime Les Crepes sweet options include strawberry, banana, caramel, apple, chocolate, Nutella, honey, jam or sugar lavender. If you don’t have a sweet tooth, they also have savory options such as Norwegian, chicken, special (black forest ham, Swiss cheese, sautéed mushrooms, spinach, green onions, and Dijon mustard), and vegi, to name a few. J’Aime Les Crepes is open from 9 a.m. to 8:30 p.m. every day. Bainbridge Island Museum of Art: A five-minute walk from the ferry terminal, this museum holds contemporary art from the Puget Sound Region. Some of the current exhibitions feature paper sculptures, glass beaded sculptures, paintings, and a gallery housing rare artist books. The permanent collection features oil paintings from Seattle artist Alfredo Arreguin, a wood sculpture by Allan Newburg, and a metal sculpture by Hekki Seppa. The museum is open from 10 a.m. to 6 p.m. with free admission all year round. Bainbridge Island Historical Museum: Visit the Japanese American internment exhibit to learn more about the camp that was once on the Island. Situated in a 1908 school house, the museum is open every day, from 10 a.m. to 4 p.m. 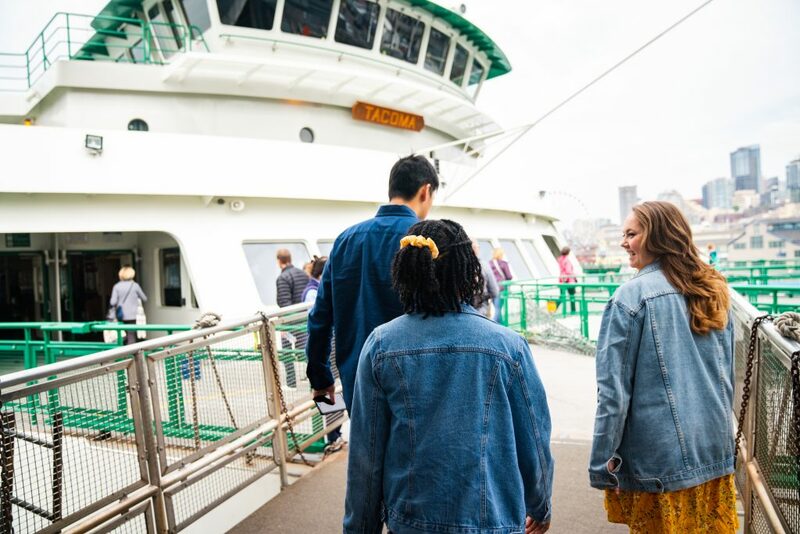 The ride back from the ferry is a great time to enjoy your last morsels of ice cream or crepe as you relax after a long day of exploring Bainbridge Island. 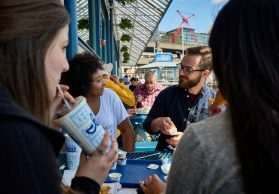 As for your next study-break outing, be sure to consider the many other options the city of Seattle has to offer, like Pike Place Market, Pioneer Square, or the Seattle waterfront.